Before you order the forthcoming reduction of number or staff, you need to eliminate all vacant positions currently existing in the organization, otherwise you have to offer them as an alternative to a downsized employee. Issue an order (order) on dismissal in connection with reduction in a certain Department, such position after the expiration of two months from the day of order. Introduce under the signature of the person whose position falls under the cut, if the person does not fall under the category of people who are not subject to reduction at this stage of time, according to the Labor Code of the Russian Federation: single mothers raising children under 14 years, women with children under three years old, the sole breadwinner in the family. After this, fill the special form from the city Center of employment of the population, which indicates the position, age, total work experience and work experience in this position. 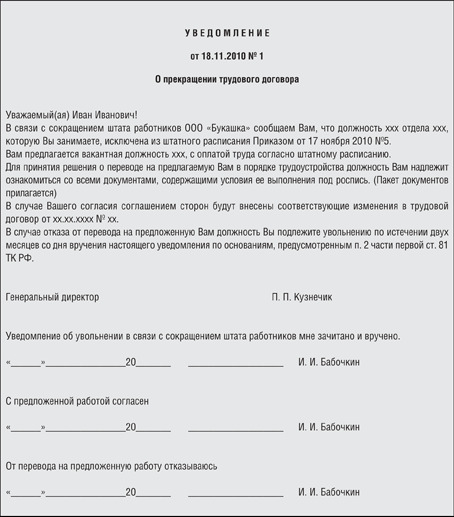 The completed application form notarized signatures of specialist personnel and the chief of the enterprise. The finished form is referred to the employment Center. Next – prepare official letter to the Union, where informed members of the trade Union organization stating that the worker is warned in two months about the upcoming reduction. The Union is responsible for the fact of this letter to hold a meeting and provide you with the minutes of the meeting. Within two months, the human resources practitioners are required to offer a redundant employee all available at the time a vacant post suitable to his qualifications. All of this is made in the form of an act with the signatures of the downsizing of the employee consent/ disagreement to the proposed position and HR. If vacant posts are not, workers still have over two months to notify laid-off employees in writing under signature about the lack of vacancies. After two months, if the employee was not given another position, was dismissed in connection with reduction of number or staff.